I'm having trouble getting the SO API Filters to cooperate. I've gone over the documentation as well as similar questions like this and this. 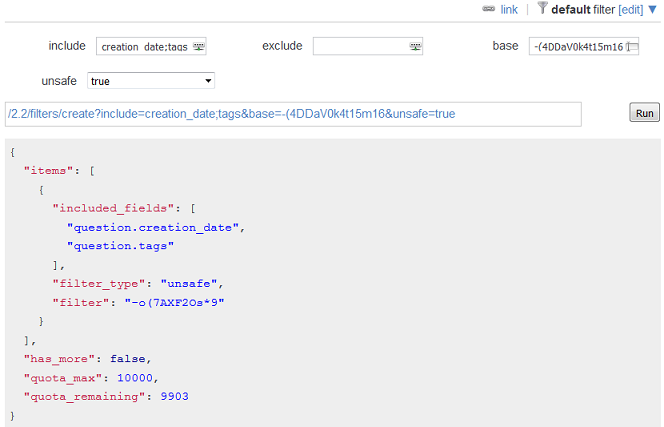 But suppose I'm interested in many records but only two fields (ie., tags & creation_date). expand Question, choose the 2 fields I want to see, and Save. No error; no results. I tried selecting Unsafe (my preference) got a different filter, but still no results. Great, a filter! So I try that one and get no results. The key mistake here is neglecting the Wrapper Object, and this is a big flaw with the filter documentation. The stuff you care about, the payload, is the total and/or in the items properties. For this reason, every filter should have .wrapper.items and/or .wrapper.total selected. More on this, below. Furthermore, your filter must return the error properties and the quota remaining, or your app/script WILL get restricted or denied by the API at some point. -- You need to monitor, and handle, errors and depleted quota, or bad things will be done to your app and/or your account. Plus one of items or total. This is the stuff you care about, and without items, the non-wrapper filters are effectively turned off. Fetching total can be equally as expensive as fetching items. Put another way, an application fetching total when not needed is potentially halving its performance. It is for this reason that total is not returned by default. I've observed(But admittedly did not collect data) that filters that have both total and items tend to bring the backoff hammer that much quicker. See below for more on paging. -- these are useful sanity checks for debug, development, and API errors. And they do not seem to "cost" anything. Note that the type property can be useful for libraries, but is seldom needed otherwise. For the above reasons, the Built In Filters from the Filters doc have terrible advice. Never use the none or total built in filters as these leave you vulnerable to undetected and unhandled errors. For obvious reason, if your app expects lots of results, your filter should also the page and has_more properties. I also recommend the page_size property. Note that several paging bugs are still unresolved, so cross checking is recommended. For paging, I make an initial call for just the total (plus the other base properties). Then I make addition items calls(without the total) to page through the results, cross checking page numbers and has_more against the previous total. In practice, none of the "built in" filters are good. none and total omit crucial wrapper properties. default and withbody include too much cruft for every scenario I've seen. Open the appropriate doc page for the path you are using. EG /questions doc. 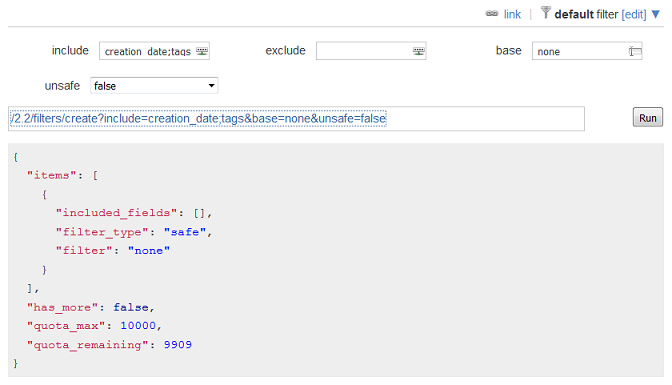 This automatically shows you only the filter sections that are relevant for that API path/query. 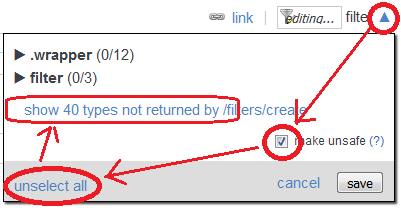 Click the filter  control and paste in the minimum base filter from step 1 above. Press enter for it to take effect. 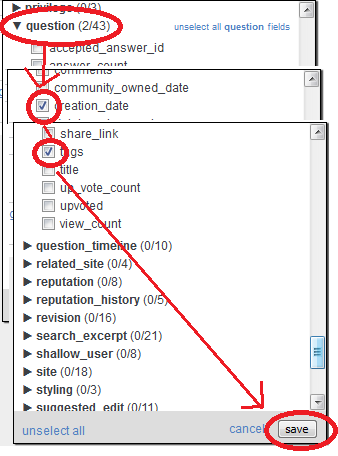 Be sure to add back the page and page_size properties if more than one item (or total) is expected. Carefully copy the resulting filter string for use in your app. Note: Don't bother with /filters/create. It is more trouble than it's worth and only useful if your app needs to generate filters programmatically -- which is rare. Not the answer you're looking for? Browse other questions tagged support api documentation api-help filter . How do I get the body of an answer, as well as the author?